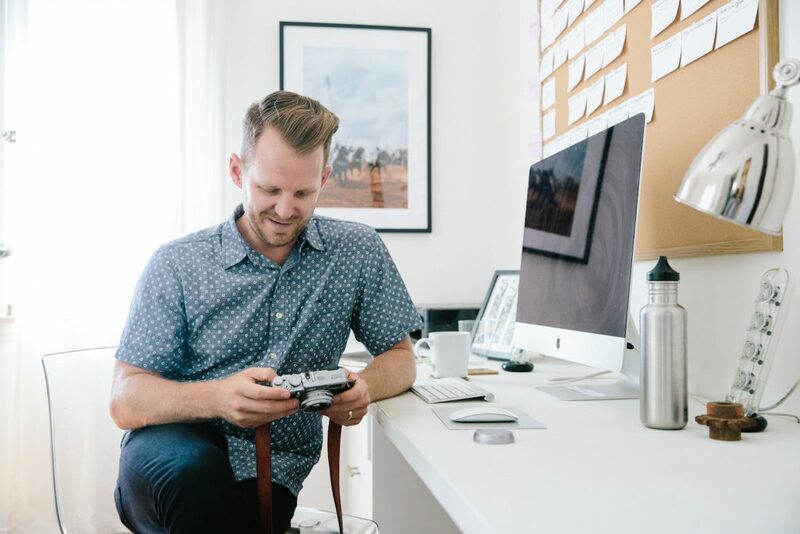 We sat down with writer, director and brand consultant, Justin Herber, in his West Hollywood Design District home to talk career, creativity, and what he loves most about The District. By looking at your career track record, you’re undoubtedly a multi-hyphenate (the career of the future!) How do you define what you do? I generally tell people that I am a writer, director, and brand consultant. What that really comes down to is figuring out ways to creatively communicate ideas through a variety of forms and mediums: films, scripts, or brand strategies and campaigns. It is sometimes difficult for even my close friends and family to get their arms around what I do because it is multi-hyphenated and non-traditional. To some people I am a writer, to others I am a painter, to some I am a creative director or documentary filmmaker, and to others I am Jessica’s husband. My schedule and responsibilities vary week to week, so every Monday is different. A few things I always try to do are to be at my desk by 9:30 (with a cup of coffee) and fit in a workout. Before moving to The District several years ago, you were living in an old firehouse in the Arts District (before it was a ‘thing’). Quite the change of environment! What brought you to this change of scenery? Living in the firehouse (especially before the Arts District had been exposed) was kind of like living in the Ghostbuster’s Firehouse crossed with the Paper Street Soap Company from Fight Club. It was an amazing bachelor pad, but had certain, let’s call them idiosyncrasies, that I didn’t want to subject Jessica (my now wife) to. When we started looking for a house together in Venice, Laurel Canyon, and West Hollywood and fell in love with the Design District. There were so many great stores and restaurants were walkable, the neighborhood was predominantly single family homes, and the layout didn’t create a lot of through traffic like in other parts of the city. In many ways, it was the exact opposite of my situation in the firehouse. We have been here for over four years and I tell everyone that this is by far my favorite place I have ever lived (no offense to Floydada, TX). If you were to spend an entire day – on foot – in your neighborhood, where would you start, where would you pitstop and where would you end up? One word that describes the West Hollywood Design District: _______.